I came up with a basic version of this hat a few years ago and wrote down most of the pattern. Recently, I had a friend contact me about making some hats for her kids for Christmas and resurrected this pattern for her daughter. I think it is a better version then the original. This hat is knit from the bottom up and makes use of the mock honeycomb stitch. 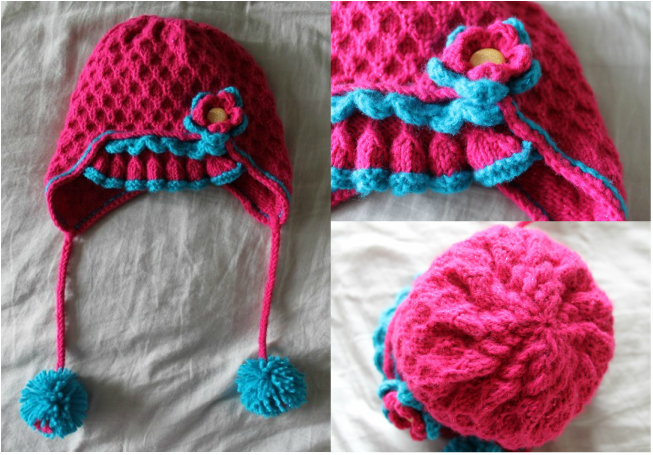 The earflaps are knit back and forth then the hat is knit in the round. For the crown, decreases are made with cables. A ruffle is added to form a "brim" and adorned with a crocheted scalloped edge. 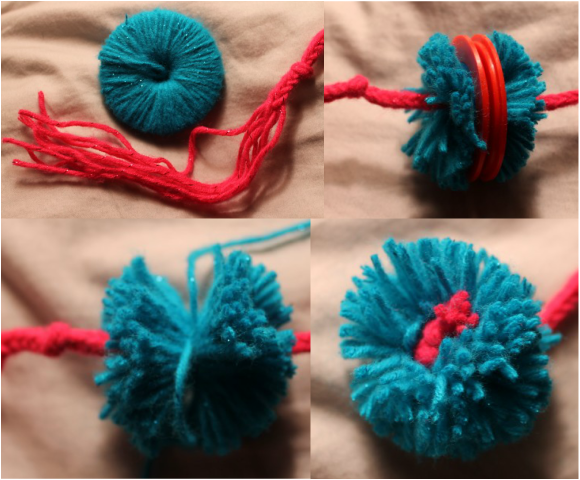 To add charm, pom poms are attached to an 8-stranded square braid. To complete the girliness of this lovely little hat, a flower with a button center is added to the corner. Cut yarn. 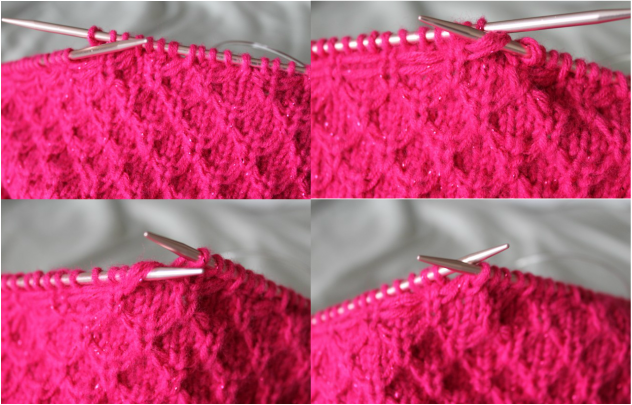 Push the ear flap out of the way of the needles and hold on the circular part. For the second ear flap, repeat the same process as for the first, but don't cut the yarn. Complete these 12 rows 4 times, then rows 1-8 once more, knit one more round and switch to double point needles. Complete these 12 rows 5 times, then rows 1-8 once more, knit one more round and switch to double point needles. Cut yarn leaving a 6" tail, thread tail through STS and pull tight to close hole. Weave in ends. 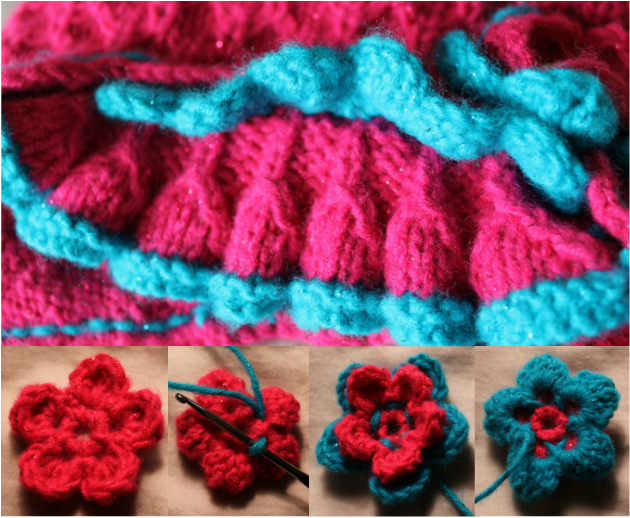 Using an E crochet hook, with MC, SC around the edge. Using the same hook, with CC, SL at the base of the SC's just made. With CC, CO 87 STS using a long tail cast on.